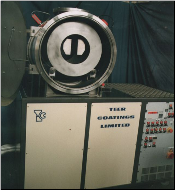 Teer Coatings Ltd » Thin Film Coatings » UK | Coating Deposition Systems . 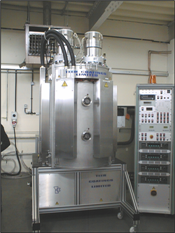 State of the art thin film coating deposition equipment incorporating the patented Closed Field Unbalanced Magnetron Sputter Ion Plating (CFUBMSIP) system. The present range of Standard Coating Systems, from small R&D based systems to large production systems, designed and manufactured by Teer Coatings Ltd, have been developed as a result of a continuing and intensive development programme and offer an unrivalled combination of flexibility, reliability, controllability and ease of use. The systems are fully computer controlled as standard, enabling simple, accurate and repeatable processing without constant supervision. Large Production Systems with six magnetrons, allow increased capacity to enable more rapid production, in particular for the solid lubricant MoST and Graphit-iC coatings. Flat 5 Coating Systems are modified UDP systems with exceptional productivity, designed to enable deposition on to items placed on flat plates using horizontal magnetrons sputtering downwards. This system has exceptional productivity resulting in low cost coatings. Teer Coatings Ltd Patented Closed Field coating process has been further developed especially for numismatic coin dies. This included the development of special ion cleaning methods to avoid damage to dies whilst still retaining the perfect adhesion that is obtained using this process. 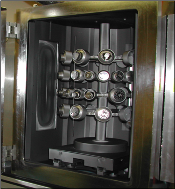 This specially developed PVD equipment and process is suitable for coating both numismatic and circulation coin dies. Barrel Coating Systems have been designed to coat large volumes of difficult-to-handle components such as fasteners, powders and ball bearings. The loose components are coated in a rotating drum which enables complete all over coverage with no need for fixturing. Custom Built Systems can also be made. Teer Coatings Ltd can draw on over 20 years experience in the design and construction of PVD systems. Specialist systems can be designed and manufactured to meet specific customer requirements.